As you may recall, I had some unfinished business in the Fray Jorge area, in the shape of the track to Caleta El Sauce. The real interest was to see if the area full of Eriosyce aurata that used to be along the track to the park was replicated elsewhere. I had become curious about a sign pointing to Quebrada Secco (Dry Canyon) off Ruta 5 north of Fray Jorge. I had nailed this down to being east of R5, so away from the coast, in an agricultural development area, despite the name. But as I approached the exit again today, I spotted a sign that claimed that to the west (towards the Ocean), the track lead to Punta Secco – Dry Point, suggesting an Ocean side location, so off I went. I had to ford water three times, each time aware that I had not seen any other cars since leaving R5 and the relative vulnerability of being on your own, so I carefully ‘walked the job’ before getting my wheels wet – no problem. We are of course all familiar with Murphy’s Law that says that unplanned incidents happen at the least convenient time and circumstances, so better safe than sorry! After some 20 km the track ended at a gate, inviting me to close it firmly behind me, then, another sign stating that this was private property and strictly ‘no entry’. Vultures were sitting on the fence post. Had somebody died? Was somebody about to? Best to turn around – the terrain I had been looking for in the hope to find E. aurata was not to be seen here or beyond and clearly I was not welcome. We have already briefly discussed Murphy’s law, so it came as no surprise that I passed 5 cars on the way back, each at the narrowest sections of the track and each driving as though the likelihood of uncoming traffic was negligible. It all ended without scratches. All cars had Skanska stickers displayed, so were involved in the building of more wind turbines. I’ve filed images taken along this side trip as S2970, but photographed no cacti, other than fences of ceroids – Trichocereus and Eulychnia. And so on to the track to El Sauce. I remained focussed – no sense in stopping at places where I had already taken images in better light than available this morning, so I reached our earlier turnaround point quite quickly. There followed quite a steep descend with the track cut out into the hillside and the cacti hanging down from the sides. Is this why Ritter used the name Copiapoa pendulina? There would have also been scope for Trichocereus & Eulychnia by that name. 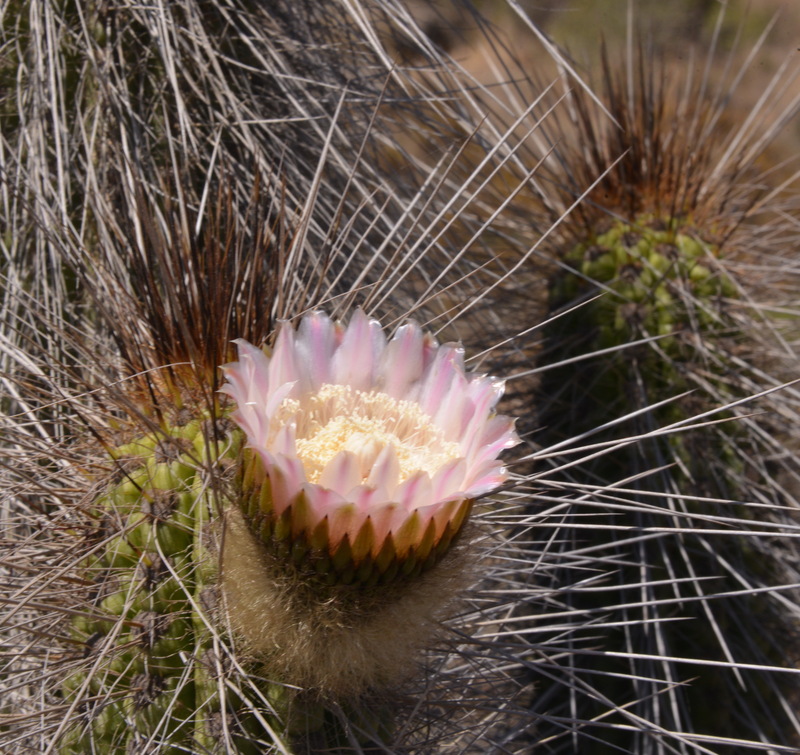 With the merits of Murphy’s Law now well understood, I did not allow myself the luxury of getting out of the car to photograph the cacti, but they obliged by coming so close to the car that an open window was all that was needed. (S2971). All this again despite the evidence of any other traffic. That waited until I had reached the bottom of the hill and a wide strip of flat sandy land covered in Eulychnia castanea, all the way to a strip of white sand and then the Ocean. This seemed the ideal spot for a toilet stop and as I was enjoying the scenery, a large Skanska truck squeezed by my car on the track and honked its horn. Yes, hi! The wind turbines could be seen on the nearby hillside that clearly was Caleta El Sauce. Another project already had ‘No entry’ signs posted on another track, to Peral Oja de Agua and it seemed that this would link up with what I saw here. Are they covering the whole coast line with turbines? Not a bad idea, given the extend of the coast line, but as in the case with Chilean wine – is there not a risk of over production? Electricity is notoriously problematic to export, say to the UK with its winging high energy prices. Perhaps a BBC Panorama programme should feature the Chilean effort in creating clean energy and shaming us into learning from them. Must read up on Skanska when I get home. I’m sure there are negatives that have cropped up as well, so again, learning from the experiences of others can be great. And I can see a project for Ian’s company: plotting all the turbines on a SatNav map if that has not been done already, to send engineers to any turbine needing a service or a fix. Back on the beach – the Eulychnia had all but swamped any other vegetation. There were still a few flowers but in the main, the plants were in fruit. This confirmed something that I had suspected but had not yet been able to photograph for castanea, that when ripe, all Eulychnia fruit swell up so that the characteristics of the hypanthium: degree of hairiness or spininess becomes less dramatic, with all adornments eventually rubbing off. The weight of the swollen fruit is such that they readily drop off and are then the food for small rodents and birds. I had noticed this before with E. acida and E.breviflora where the ripe fruits made regular ‘plopping’ noises as they fell to the ground and ‘exploded’. Dried fruits that we often see at the base of Eulychnia with the hypanthium dried up and shrivelled away with hairs or spines still in tact are likely to be fruits where the ‘ripening process’ has not been successful, possibly because the seed had not been fertilised or that small ‘worms’ (borer beetle larvae?) had eaten the seed and the fruit had thus failed to produce the ripening hormones. 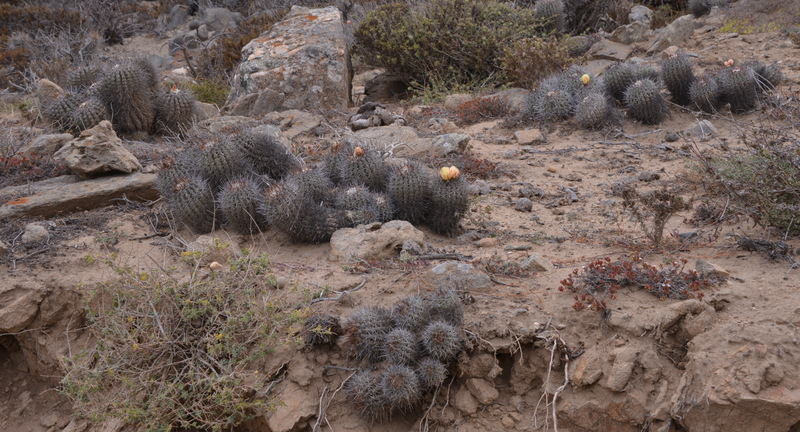 I only managed to find one small clump of Copiapoa coquimbana and one plant of Eriosyce sp (the widespread E. subgibbosa?). An interesting stop, particularly as it seems to me that this place has not had the usual hordes of cactus tourists and may not be around for visits in years to come as security of ‘renewable energy’ power stations may bar entry to the sites. Pleased with this morning’s activities, I dodged the numerous Skanska vehicles that again made the drive back a challenge and, once back on R5, I drove on to the Copec station to fuel the car up for tomorrow’s drive to Pichidangui and to treat myself to a hotdog, Expresso Doble and a sweet roll. As usual, after placing my order in perfect Chilean, the lady serving me gave me her life history (long version) in Spanish, to completely dumbfound me. A fellow customer, fluent in Spanish AND English translated and asked if I wanted to eat the order in or take it away. Ah, outside on the terrace please! He was younger than she was, so his life history was much briefer than that of the waitress. On the way home I had time to think about which route to take back to the cabaña. I decided on the Tongoy exit and then took another left (west) to Playa Blanca where earlier this week I had seen a ‘strange’ Eulychnia. By now the sun had come out from behind the usual low cloud cover and had pushed the temperature up to c 28 C. It did not take long to find the plants that were hellbound on confusing me. Flowering was at the side of the stems that were upright in habit and which showed no sign of ‘horse tail like spination’ on stems that had flowered before. So that fitted in wonderfully with E. acida, so they had to have large scaly, mostly glabrous fruits. Well, sort off. While the top of the hypanthium matched any description for acida, lower down, long honey coloured wool was abundant, a feature of E. breviflora. Acida is the common plant seen south of the Rio Elqui, with E. castanea hugging the strip nearest to the coast, but not found north of Guanaqueros in my records. E. breviflora is common north of the Elqui Valley, has the honey coloured hairy hypanthium but is on the main a much shorter shrub, with any E. acida that is found north appearing mainly inland, with a tree like habit. So much for stereotype descriptions. These were clearly ‘different’ from what I had seen and recorded before, so worthy of a name to allow me to refer to them in future reports. Earlier I had christened this population, that extends east to Tambillo on my day trip to Andacollo, Eulychnia breviflora ‘tambilloensis’. Perhaps it also calls into question the importance attached to hypanthium characteristics in past classifications of Eulychnia. There is also still the oddity found on the beach at Bahia Teniente, a Eulychnia of E. acida like stature, but with the characteristic fruits of E. castanea. That had just been a single plant while today’s plants were abundant over two stop and consistent in their appearance without any ‘other interlopers’. Perhaps E. ‘tenientesensis‘ is no more than an (interesting) one off sport. I had also looked for, but failed to find similar plants at near by La Cebada. Plenty of stuff to mull over with a glass or two of wine tonight and at future meetings in the UK. Helmut Walter was rumoured to be writing a book or article on the genus, so I wonder what has become of that. Nature must have taken a lesson or two from Murphy – every time you think you have found some rules to apply to naming plants, Mother Nature taps you on the shoulder and asks: so how do you account for this? Once again I have to thank you for sending me your comments on the trip. I feel as if I with you there.